California Munchkin Rescue View other Munchkins for adoption. 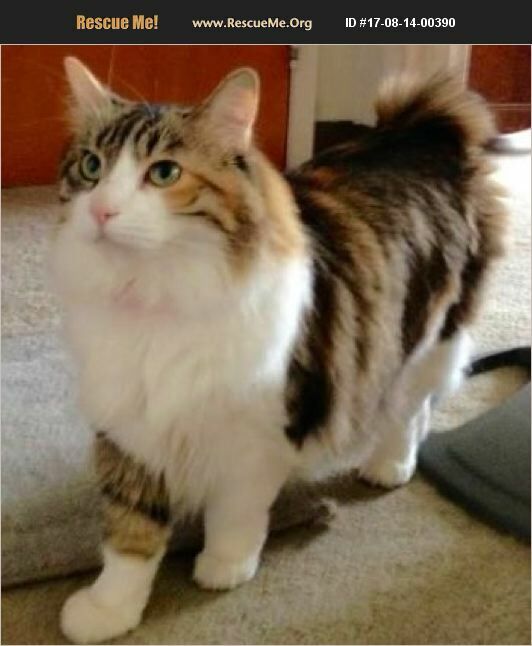 A Calico Munchkin/Manx mix�'�|now if that doesn't sound like a unique and fabulous kitty! A very dear friend of Poppi's current owner tells us that Poppi is hilarious when she walks away, because it looks like she is wearing old-fashioned pantaloons and you'd think she was carrying a parasol with her high society sway. Who wouldn't want to watch something so adorable on a daily basis? Yes it is always so heartbreaking to get a request to help find a permanent home for a beloved pair of kitties. It is only because their owner's health is fragile that taking care of her sweet kitties is something she cannot do for much longer. She contacted our organization to help find a wonderful home for this sweet pair. Poppi is bonded with her handsome boyfriend Leo, who is an equally engaging kitty. She is up to date with all of her vaccinations and she uses her litter box without any issues. Oh, and when it comes to eating, Poppy apparently will eat everything that doesn't bite back.